Check these tough babies out! 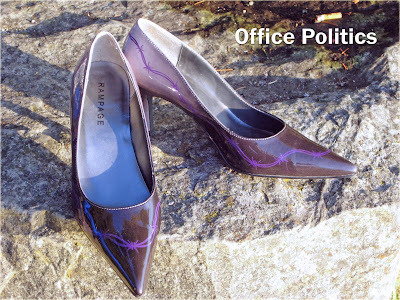 Wear these with your gray power suit into your next meeting with the directors and Bam! Ain’t nobody gonna mess with you Girl! These beauties go from dark gray toes to nearly white at the heels. Then, atop that, they’ve got wicked purple barbed wire circling your foot. A simple design that speaks for itself. Nice job Yank!